Could this be a slice of your life? You walk into a mall or a supermarket for groceries. Your pick up packets of Delishus, Dark Fantasy, Bingo and Yippee! noodles for your kids. Then, pick up a bag of Aashirvaad atta, followed by a packet of a ready-to-eat dish from Kitchens of India, to take care of dinner on the day of the late evening meeting. You browse your grocery list and reach out for deodorants and incense sticks (agarbattis). The Engage and Mangaldeep in the shopping trolley are followed by a packet of AIM matches. A few seconds later, you remember that your daughter has asked for a ‘Classmate’ notebook. Before you head for the billing counter, you pick up the last item: Fiama Di Wills Skinsense. As you wait for your turn at the counter and look at the items in your trolley, you might realise that everything there is from one single company—ITC. Okay, what we have just described might be too much of a coincidence, but what is rooted in reality is that ITC is fast grabbing space in grocery shelves and trying to enter every single room of your home. Its food items make way into your kitchen. The personal care products head for the washroom. There’s stationery for your kids’ room and your workdesk. The incense sticks and matches go to your pooja room. American investment guru Peter Lynch is said to picked up stock investment ideas when he spent time with his family or visited a mall. Would the fictional shopping visit have given him an investment idea? The existing stock investor will tell you that investing in ITC has been a no-brainer for long. Here’s why. An investment of Rs 10,000 made in the ITC stock in 2000, when the company’s new FMCG business foray hadn’t taken off, would have given you about Rs 1.25 lakh today as opposed to about Rs 53,000 if you had invested in Sensex. The rewards of being an ITC shareholder also includes its regular dividends, which has typically been Rs 3.10-5.25 (between year 2005-2013) per share. 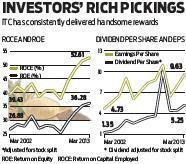 It’s earnings per share (EPS) has increased from Rs 4.73 (considering share split) in 2001-02 to Rs 9.63 in 2012-13. But one would suppose that shouldn’t have been too difficult for a rapidly growing conglomerate spread out in other areas such as cigarettes, hotels, paperboards, paper and packaging, and agribusiness, whose net sales grew more than six-fold from Rs 5,230 crore in 2001-02 to Rs 31,627 crore in 2012-13, and net profits also grew more than six-fold from Rs 1,162 crore to Rs 7,608 crore over that period. As we go to the press, ITC is No. 3 among Indian stocks in market capitalisation and has the highest weightage of 10.29 per cent in the Sensex. 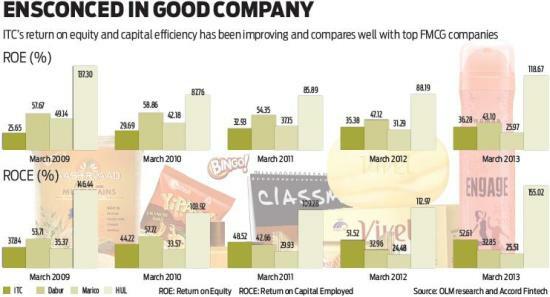 ITC’s growing new FMCG business has started contributing significantly to the company’s growth. In 2012-13, it accounted for net sales of Rs 7,028 crore, 16 per cent of the company’s gross revenues from operations, and grew at 27 per cent that year. In fact, in the last five years the business has grown at a very impressive compounded annualised growth rate (CAGR) of 22.73 per cent. The growth of this business has been marked by the company’s relentless entry into new areas and expansion in existing ones with the establishment of its own brands. As ITC invested crores of rupees, there were bound to be operating losses. Yet, even this has been on the decline and the fourth quarter of 2012-13 actually showed a profit of Rs 11.87 crore and reduced the net loss for the year to Rs 81.26 crore compared to the Rs 195 crore in 2011-12. There is enough evidence that ITC will carry on this scorching pace. “As far as I am concerned, we have just got started and since we have the hunger to grow fast we will continuously invest in our products and brands while ensuring that each business gives us returns,” says K.N. Grant, executive director, ITC. The company wants to be the number one FMCG player in India and its quest is likely to be aided by a number of macroeconomic factors. “FMCG holds huge potential and if you take any study, the forecasts are that the industry is set to grow over three times over the next 7-8 years, driven by rising incomes, favourable demographics, urbanisation and the relatively low levels of penetration and per capita consumption of FMCG products in India,” says Rajiv Tandon, chief financial officer, ITC. 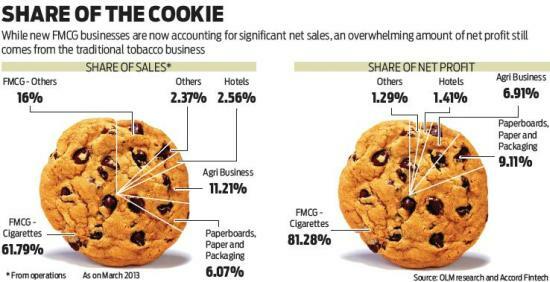 Even as the new FMCG businesses were growing, ITC’s other business segments having been growing as well and, as a result, ITC, known mainly as a tobacco company for the better part of its 103-year history, now has 38.2 per cent of gross revenue from operations arising out of its non-tobacco business. Clearly, the growth of the new FMCG business has played a major role in the change of the revenue mix. At the same time, as much 82 per cent of profits or Rs 8,694 crore in 2012-13 still came from the tobacco business, where ITC has been dominant for so long. For years now, ITC’s tobacco business has been like a roaring volcano spewing up cash which has funded its diversifications. “The leadership of our cigarette brands provides the basis for the cash flows that are the enabling the creation of world-class Indian brands in multiple segments. They are also the basis for building the capital-intensive hotels and paperboards businesses,” said Y.C. Deveshwar, chairman, ITC, at the company’s annual general meeting on 26 July this year. With the new FMCG business gaining critical mass now, a significant question for existing and prospective ITC investors is: Can the businesses alter the profit matrix in the near future and reward shareholders handsomely? As always, there would be skeptics with justifiable concerns. “One thing that one needs to be careful about companies with excessive free cash flows is that their diversification efforts often swallow value rather than creating it,” cautions Pankaj Ghemawat, Anselmo Rubiralta Professor of Global Strategy at IESE Business School and Distinguished Visiting Professor of Global Management, Stern School of Business, New York University. Adds Suruchi Jain, equity research analyst, Morningstar India, “In our view, the bulk of these businesses fail to exhibit competitive advantages and are not profitable or only modestly so in comparison to cigarettes—which doesn’t strike us as a wise use of cash.” On issues such as these, it helps to also have the company’s view to add to the perspective. “You are seeing an aggregation of various categories in different stages of evolution. Internally, we have a matrix for each category and each one is benchmarked. Some of them, like biscuits and atta, are earning healthy margins,” says Tandon, referring to the profitability of the new FMCG business. Since new brands are being launched frequently and new areas entered into, it is difficult to draw too many conclusions from the profitablility numbers. “We have a comprehensive five-year rolling plan and performance goals are set based on the stage of evolution of each of the businesses. We have put in place robust planning and performance management processes,” says Tandon. The key also lies in understanding the nature of ITC’s growth path. “They understand that they need to grow in an evolutionary manner and not in a revolutionary manner. It’s their experience in the cigarette business that has made them good at it,” says Jagdeep Kapoor, a brand expert and chairman and managing director, Samsika Marketing Consultants. Unlike a deposit in a post office, whose returns are predictable, shareholder returns, even for that of a company with a stellar record is impacted by macroeconomic and other external factors as well as issues and risks faced by the company itself. One way of evaluating the sustainability of the growth trajectory of ITC’s new FMCG business would be to examine the sustainability of major strengths that has helped the company accomplish what it has so far. When this is supplemented by an analysis of identifiable hurdles to its growth, the picture should become clearer. Harnessing internal strengths. “All our initiatives in the last 10 years are based on the internal and institutional strengths and it is not something unrelated. We engage in opportunities that best match our internal capabilities,” says Tandon. This is in contrast to its financial services diversification in the 1990’s that the company eventually exited. The company has harnessed its existing strengths in a whole host of areas. “A large part of ITC’s business model primarily adds value to the agricultural economy and agri products, thus helping the rural economy while serving consumer needs,” says Grant. Apart from sourcing, the company has used its knowledge in packaging and strengths in distribution, to name just a few areas. The obvious larger logic of ITC’s diversification is to have other areas of revenue and profit than tobacco, which, despite its high profits, faces toughening regulations such as smoking bans in public places and ban on advertisements, besides regular tax hikes. “ITC’s diversifications do serve the purpose of having other businesses which do not have the regulatory and taxation risks,” says Ritwik Rai, deputy vice-president–equity research, Kotak Securities (Private Client Group). Balancing the short-term and long-term goals. “The company’s strategy is anchored around delivering superior stakeholder value over the short-, medium- and long-term,” says Tandon. This is important as ITC needs to take care of the interests of all stakeholders, be it farmers, vendors, associates, employees or investors. While investors will like regular rewards, the company will need to ensure that it is working to create long-term value too. “We follow a principle that we will not do something that will impact us only for the quarter. We believe while short-term is important, but long term is even more important,” says Chitranjan Dar, divisional chief executive, Foods Division, ITC. Supply chain control. Like outperforming companies that handsomely reward shareholders by creating consumer value, a standout feature of ITC’s businesses has been the degree of control it has over all aspects of its products—from the time it is conceived, to its manufacturing processes, to its marketing, to the delivery to the consumer at a small grocery shop or a large mall. Years of experience in the tobacco business, where it has mastered this, has helped made it replicate it in all its new FMCG businesses. Being on top of supply chain has many advantages, one of them being that you handle external shocks like rising inflation of inputs better by working on costs down the chain, besides ensuring a constant high quality so that sales don’t suffer from consumer migration. Nothing illustrates it better than the success of its stationery brands Classmate and Paperkraft. The education and stationery products business sources the paper from its paper division at Bhadrachalam and supplies it to 21 associate small-scale industry (SSI) partners since making notebooks is reserved for this sector, gets them manufactured as per its specifications, thanks to technical and other support it provides. It then markets the notebooks through its 800 distributors who ensure supplies to 100,000 stationery outlets. The company also supplies notebooks directly to over 3,000 schools. “Our business model is predicated on outsourced manufacture of customised products from small & medium enterprises. We concentrate on product innovation, brand & trade marketing and supply chain collaboration,” says Chand Das, chief executive, education & stationery products business, ITC. The same holds true for Mangaldeep, India’s leading brand for incense sticks or agarbattis, where ITC works with women’s self-help groups (SHG) involving 40,000 women who make them (this product, again, is reserved for the SSI sector) as per ITC’s specifications through a simple mechanical process for which training is provided. Focus on brand creation. ITC hasn’t just entered new areas, but it has focused on creating brands to drive home its advantage of control over its supply chain. “If you have strong and powerful brands, you will be able to leverage them better and, consequently, it gives better returns to all stakeholders all the way down the value chain, be it farmers, other producers or suppliers, employees and all other stakeholders,” says Grant. Having reaped the benefits of strong cigarette brands, ITC has gone on to implement the learning in new businesses and has spent serious advertising funds. “They have spent a disproportionate amount of money on advertising as compared to other brands. If in biscuits someone spent Rs x, ITC has spent Rs 3x,” says Harish Bijoor, marketing expert and CEO, Harish Bijoor Consults. Considered product launches. All the products launched by ITC have taken place after enormous market research and following a structured process. For instance, Fiama Di Wills got launched after almost four years or preparation. “One great quality they have is patience. That is a very important factor in FMCG business,” says Kapoor. One of the things that ITC has done to differentiate its products has been to suit them for local requirements successfully. This has helped it even take on established players. In the personal wash segment, this meant making soaps that would work well in the water belt prevalent in different areas. In the foods business, this meant bringing in local flavours. “We try to indigenise snacks with very local flavours,” says Dar. And for the education and stationery products it meant bringing out various types of notebooks—such as those for students and for officegoers. “We realised that the Indian notebook market is an amalgamation of a lot of regional markets and astonishingly there are local preferences in terms of size, binding and ruling,” says Das. Key to these efforts is ITC Life Sciences and Technology Centre at Bengaluru, where more than 300 scientists work, including 70 who hold PhDs. Many of them have worked in prominent assignments abroad. “We have looked at ITC’s Life Sciences and Technology Centre from a three-pronged perspective. There is the ‘here and now’ product development for the next six months to one year, there is a medium-term objective and a long-term goal,” says Grant. Elaborates C.C. Lakshmanan, chief scientist, Research and Technology Innovation, and head of the ITC Life Sciences and Technology Centre: “We have a very aggressive patent strategy in sync with our priorities of process/product development.” An effective system of knowledge-sharing within the group also helps. For instance, the hospitality business provided consumer insights about premium consumers to the personal wash business for soaps and gels and helps in creating local flavours in the foods business. Innovative packaging. Given their existing presence in packaging, ITC’s new FMCG business has benefitted enormously from innovation in packaging. For new FMCG brands, this could be a key differentiator in terms of aesthetics and understanding of packaging materials. Personal care products, such as Vivel Luxury Crème and Fiama Di Wills Talc came up with innovative packaging. Forecasting and manufacturing flexibility. This plays an important role in the financials. Previous exposure in the agribusiness has helped ITC in having excellent forecasting capabilities, especially for requirement of inputs or anticipating consumer demand. The latter can be critical in areas such as notebooks, where the demand is seasonal, peaking when children move to a new class. Add to this are the local quirks in consumer demand. Since accurate forecasting has to be backed by flexible and smart manufacturing, ITC has got on top of that too. For instance, the foods division plant in Pune makes 48 different variants of the same product with much of the production happening simultaneously. “Our ultimate goal as far as our supply chain is concerned is to manufacture as close to the consumption point as possible so that the consumer gets the freshest product while simultaneously ensuring that the overall supply chain costs per unit are the lowest,” says Grant. For cost-effective localisation, smart manufacturing holds the key. Segmentation and brand promotion. ITC’s new consumer businesses’ growth indicates its success in understanding a completely new set of consumers, such as homemakers and the youth. “We have benefited from psychographic segmentation to position our brands and based the positioning not just on usership, demographics and geography,” says Sandeep Kaul, chief executive, personal care products business, ITC. The target consumer segment also impacts margins. One of the lessons ITC has learnt in its new FMCG businesses is that it is better to start from a premium segment, where people seek more value for money, and go down the ladder, rather than start from the bottom of the pyramid. “Our intent is to have a product portfolio that services a large part of the Indian market and caters to the needs and aspirations of all segments of consumers. We are probably not focussing at the moment on the very bottom of the pyramid, but apart from that a very large portfolio has been thought through,” says Kaul. Of course, the positioning has to be backed by marketing efforts and experts are fulsome in praise of the ITC performance so far. “What has worked for ITC is a judicious integrated brand marketing strategy—a mix of segmentation, positioning, branding, product portfolio, availability, advertising, promotion and pricing. One thing is that they have done nothing half heartedly,” says Kapoor. Compliments come from Bijoor too. “In terms of branding they have a lot of creative inputs and in terms of brand imaging they have a fun element in their products,” he says. An example can be found in the Classmate notebooks, where the company added educational and other content as part of its overall effort to create an emotional connect with the children that use them. All this might be fine, but hard-nosed investors would wonder whether ITC can do all this within the limits of financial prudence. To make sure that it does, the company has an established system of evaluation and has markers. “We keep reviewing our numbers in terms of both topline and bottomline. The bottom 20 per cent would only give you 1-2 per cent of your sales while the top 20 per cent would provide 80 per cent. The bottom 20 per cent keeps getting knocked out because they haven’t delivered,” says Dar. Creating and leveraging distribution. ITC has always had distribution strengths in modern trade, that is, large accounts who buy centrally for sale through separate outlets. It also had a great reach to paan shops and similar outlets. 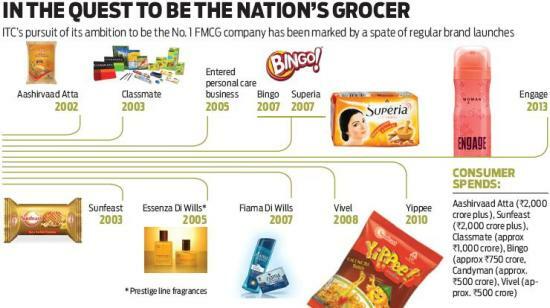 However, for many of the new FMCG brands it had to create distribution from scratch as the consumer segments were new. It had to make other improvisations as well. For instance, for distribution of Classmate, it had to get its distributors to actively stock the outlets, a completely new practice. While the existing and acquired strengths that helped ITC’s new consumer businesses will keep working for it, two aspects influencing growth are worth examining. The first is the volcano of cash from the tobacco business. Almost all analysts don’t see the supply getting interrupted. Given its dominant market position, thanks to its brands, great control over the supply chain, absence of fresh competition, especially from new foreign players because of existing regulations, and a ban on advertising that helps incumbents, all the indications are that its status quo will continue. The second relates to human resources. Unlike many other companies, ITC is unlikely to face any problems on this front. As in the past, thanks to reknowed human resource systems, the company is likely to keep attracting the best talent in the country who typically progress up the organisation successfully taking up bigger responsibilities. “There are tremendous growth opportunities given the large spread of ITC’s FMCG businesses,” says Lakshmanan. To bolster high growth, ITC has created a unique corporate culture promoting intrapreneurship, or entrepreneurship within the company. “ITC’s Corporate Management strategic management role can be defined in some ways as similar to a venture capitalist. We provide individual businesses with critical resources including financial capital, human capital, sharing of best practices as well as common central services,” says Grant. This brings us back to the question on whether new consumer businesses would be able to alter the profit matrix as much as it has been able to the sales matrix. From where we stand, a dramatic change in the profit matrix seems unlikely. “ITC’s cigarette business would continue to do well despite taxation and regulatory hurdles. Those who smoke will smoke,” says Rajen Shah, chief investment officer, Angel Broking. Other experts have similar views. 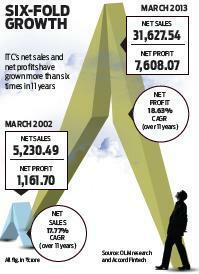 “Cigarette profits for ITC have grown by 15 per cent CAGR in the past 10 years. It can sustain this kind of growth in future as well,” says Amnish Aggarwal, senior vice president-research, Prabhudas Lilladher. ITC is likely to keep launching new brands for new segments and even enter new areas. For instance, it is inconceivable how any FMCG company can become the numero UNO without being in detergents, beverages, dairy products, oral care and hygiene products. “As and when they enter new segments in FMCG, there would be pressures on their margins,” says Abneesh Roy, associate director (research), Edelweiss Capital. Therefore, it is likely that we will see sales grow as well as in the past with some of it depending on the economic conditions even as it progressively bites off its accumulated losses and finally breaks even. “The FMCG business is currently loss-making and will break even in a year or two,” feels Gaurang Kakkad, vice president-institutional research, Religare Capital Markets. The growth of ITC’s new consumer businesses will also depend on how well economic growth gets dispersed. In the recent years, government schemes benefitting people in rural and semi-urban areas have brought a large number of people into the consuming class. If the current slowdown impacts economic growth or its spread, FMCG businesses including ITC’s, are bound to be impacted negatively in some way or the other. ITC will also face competition from global players in existing businesses such as education and stationery, as well as in new ones that it enters. Some market experts argue that ITC’s efficiency in capital use would have been better had it not been for its diversifications, especially new FMCG businesses. “Return ratios would have been stronger if the company had diversified less, but then the opportunity size shall not have been the same. In some cases (for example, atta), it is also likely that ITC may not have had the competencies that it has now,” feels Rai. While the profitability and serious profitability of new consumer goods businesses might still be some time away, there is plenty of evidence that if there is one company which has the wherewithal to pull this new initiative off, it is ITC.